In 1999, Matt Groening followed-up the monumental success of The Simpsons with an idea for a sci-fi comedy that he’d been tinkering around with for years. With influences ranging from groundbreaking sci-fi movies like Blade Runner to shows like The Jetsons and pulpy ‘50s comics like Weird Science, Futurama proved to be yet another winner for the cartoonist. Characters like Fry, Bender, and Leela quickly became fan favorites, rivaling Homer, Marge, and the rest of Springfield for quotability. The show was also a hit with the critics, winning plenty of Annie and Emmy Awards along the way. Never a ratings juggernaut to a larger audience, the show only lasted four seasons on Fox before being cancelled in 2003. 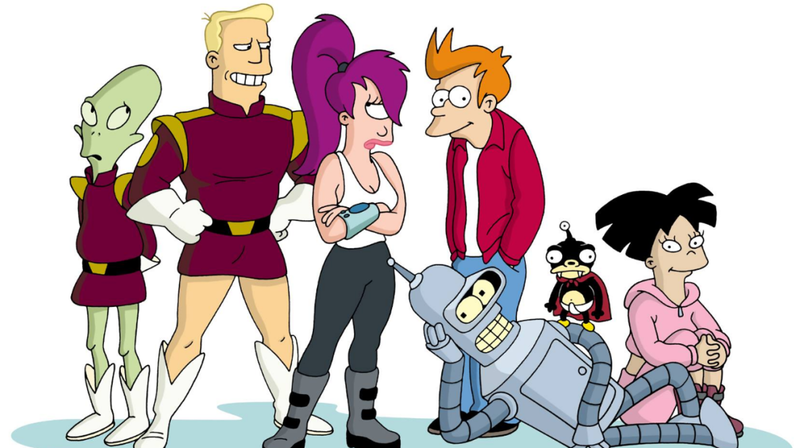 Neither the production staff nor the series’ loyal fan base would give up on Futurama, though, and the series was revived for an additional three seasons on Comedy Central from 2008 through 2013. Here are 10 things you might not know about Futurama. 1. THE SHOW’S NAME COMES FROM AN EXHIBIT AT THE 1939 NEW YORK WORLD’S FAIR. Though Matt Groening’s Futurama takes a comedic look at what the future might hold for us, the name is based on a very real-world version of the world of tomorrow. At the 1939 New York World’s Fair in Queens, GM built a mammoth attraction called Futurama, which was a scale-model city showing off the predicted wonders of 1960. The model was the brainchild of industrial designer Norman Bel Geddes and his team of hundreds of artists and builders. It spanned an impressive 35,000 square feet, and gave audiences a glimpse at what a city might look like in the next 20 years, with the highlight being a monolithic utopia peppered with mountainous skyscrapers and a web of superhighways for futuristic GM cars to travel on. Visitors would sit in chairs that moved on a conveyer belt around the model, showing off all the wonders they could look forward to. To pay homage to its namesake, the first thing Fry hears when he’s defrosted in the future during the pilot episode is the bellowing sound of a lab worker proclaiming “Welcome to the World of Tomorrow,” which was one of the heavily advertised themes of the fair. Futurama’s main theme, composed by Christopher Tyng, bears a striking resemblance to the song “Psyché Rock" by French electronic artist Pierre Henry. The songs are so similar that the Futurama theme basically acts as a remix to Henry’s work. The song has also been remixed by Fatboy Slim, which is even closer to the Futurama version. 3. GETTING THE SHOW ON THE AIR WAS A DIFFICULT PROCESS FOR MATT GROENING. Despite the battles with the network, Groening and his team didn’t cave, saying, “I resisted every step of the way. In one respect, I will take full blame for the show if it tanks, because I resisted every single bit of interference." 4. CO-CREATOR DAVID X. COHEN IS A MATH WHIZ. When Groening was developing Futurama into a pitch, he had one key Simpsons writer in mind to collaborate with: David S. Cohen. Cohen (who is credited as David X. Cohen for Futurama) was known for some of the most popular Simpsons episodes of the mid-‘90s, including "Itchy & Scratchy & Poochie," "Lisa The Vegetarian," and "Much Apu About Nothing." “After I assembled a few hundred pages of ideas, I got together with David Cohen, one of the writers and executive producers on The Simpsons, who is also a lover of science fiction and has a great knowledge of science and mathematics,” Groening told Mother Jones. The emphasis on mathematics may sound odd, but it became a hallmark of the series. Dealing with sci-fi plots allowed Cohen to bring a certain authenticity to some of the more complex episodes; he was also able to sneak in all sorts of esoteric mathematical jokes for the like-minded viewers. This is similar to how math played a role on The Simpsons for years without ever becoming distracting to casual viewers. Cohen’s mathematical background goes far beyond the norm. He graduated from Harvard with a degree in physics, and from the University of California, Berkeley, with an M.S. in computer science. This knowledge gave way to plenty of in-jokes, including the creation of a numerical-based alien language and countless background gags that only the brainiest viewers would have a shot at deciphering. 5. ZAPP BRANNIGAN WAS GOING TO BE VOICED BY PHIL HARTMAN. The character of Zapp Brannigan was originally written with actor Phil Hartman in mind for the voice, but he was tragically killed before he would have begun recording. The role then went to Billy West, who also voices Fry and Professor Farnsworth. In an interview with The New York Times, West says he based his Brannigan on disc jockeys from the ‘50s and ‘60s. There's also a bit of Hartman's signature, Troy McClure-esque sound in there. 6. JOHN DIMAGGIO ORIGINALLY AUDITIONED FOR PROFESSOR FARNSWORTH USING BENDER’S VOICE. Figuring out what Bender would sound like wasn’t an easy task for the folks in charge of Futurama. Would it be a human voice, or something more synthesized like Robby the Robot from Forbidden Planet? The crew auditioned dozens and dozens of voice actors in an attempt to find the perfect Bender, with no luck. At the same time, voice actor John DiMaggio was auditioning for a role on the show against his agent’s wishes, who worried about both the money and contract being offered. At first he auditioned for the role of Professor Farnsworth, using a boorish, drunken voice he partially based on Slim Pickens. The voice didn’t work for the professor, but according to the DVD commentary for the show’s pilot, the producers asked him to try it out for Bender. The voice instantly clicked, leading to the creation of the show’s breakout character. 7. THE NIXON LIBRARY EVENTUALLY CAME AROUND TO HIS HEAD BEING IN A JAR. Richard Nixon famously proclaimed that the media wouldn’t have him to “kick around anymore” back in 1962; little did he know the jabs would keep coming for decades in the real world, and centuries into the fictional future as a nightmarish version of the former president with his head preserved in a jar was proclaimed President of Earth in Futurama. With Billy West providing the jowly voice of the former Commander-in-Chief, Nixon became a villain for a whole new generation. And the Richard Nixon Library wasn’t very happy about it at first. “[E]arly on in the show the network got a letter from the Richard Nixon Library saying they weren’t pleased with his portrayal and would we consider not doing it,” Cohen told WIRED. But a few years later, things changed. 8. WRITER KEN KEELER INVENTED A NEW THEOREM JUST FOR THE SHOW. In addition to Cohen, Futurama is staffed by a roster of Ivy League graduates with backgrounds in science and math. But while writing one episode, the staff had created a plot so complex that the crew soon found itself stumped. The episode was “The Prisoner of Brenda” from the sixth season, and it involved a brain-switching machine that could swap the minds of any two people that stepped into it. There was only one problem: once used, the machine couldn’t be used twice to swap the same two minds back to normal. This means numerous pairs of other characters would have to use the machine in a roundabout plan to restore everyone’s mind to their proper body. Though the idea sounded like a winner to the writers, Cohen recalled that they soon realized they had to create a mathematical explanation that could get everyone’s mind back. It was like a nightmarish SAT problem for the staff. That is until writer Ken Keeler, who has a PhD in mathematics, created a completely unique theorem that proved this plot was possible. In the episode, the mathematical heroes that solve the problem are none other than the Harlem Globetrotters, who are among Earth’s elite intellectuals in the 31st century. 9. THE SHOW’S USE OF FORESHADOWING IS INTENSE. Futurama touts more than just science and math cred; the show is also one of the more intricately plotted animated series of the past 20 years. The show is notorious for leaving morsels of foreshadowing in episodes that pay off weeks, months, or even years down the road. Plot points like Fry being his own grandfather and Leela’s mutant heritage were all hinted at before they became reality, but the most obscure piece of foreshadowing came right in the pilot episode. It happens right as Fry is leaning back in the chair that would “accidentally” topple over and send him into the cryogenic chamber, leaving him thawed out in the 31st century. For a brief moment, a shadow flashed across the screen with no explanation—at the time, it likely went unnoticed by many viewers. Fast forward to the season 4 episode “The Why of Fry,” and we learn that the shadow belonged to Nibbler, who had traveled back in time to 1999 to push Fry into the chamber because he was the key to stopping an alien invasion in the 31st century. It's just one example of the type of intricate world-building that the writers of the show poured into every episode. 10. EACH EPISODE TOOK ABOUT A YEAR TO COMPLETE. Every episode of Futurama is a labor of love, with each joke and frame of animation put under intense scrutiny. 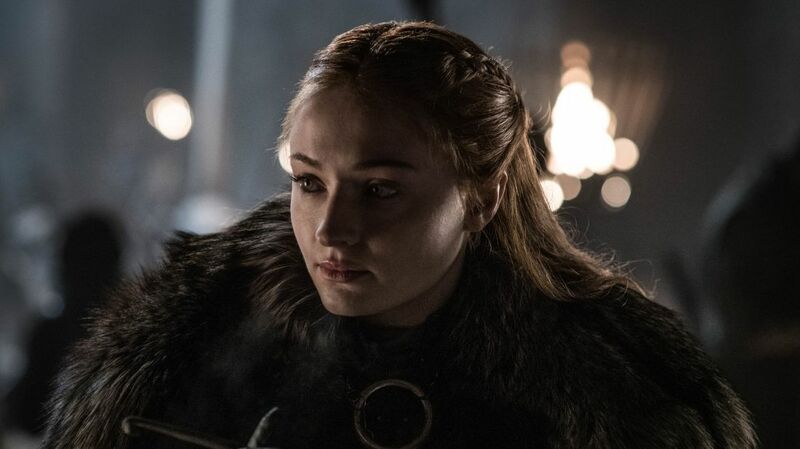 Because of this, there is a lot of work involved in the show—about a year’s worth for each episode. “It's usually somewhere in the vicinity of a year from the beginning of a Futurama episode to the day when you can see it on TV,” David Cohen told The Atlantic. Then it’s recorded by the actors—like an old-timey radio show, according to Cohen—and then it’s given to the animators. That process involves animatics and final animation, which can take around six months to finalize. Whether you know James McAvoy from the X-Men movies or have been a fan since his early gigs on British television, there's no denying that 2019 has already been a very good year for the Scottish actor. In addition to his starring role in M. Night Shyamalan's Glass, McAvoy is set to star in June's Dark Phoenix, will be taking on the role of an adult Bill Denbrough in It: Chapter 2 in October, and will appear in the upcoming TV version of His Dark Materials later this year. And to top it all off, he’s turning 40 on April 21. In celebration of McAvoy's big day—and even bigger year—here are some things you might not know about the Golden Globe-nominated actor. 1. He was raised by his grandparents. 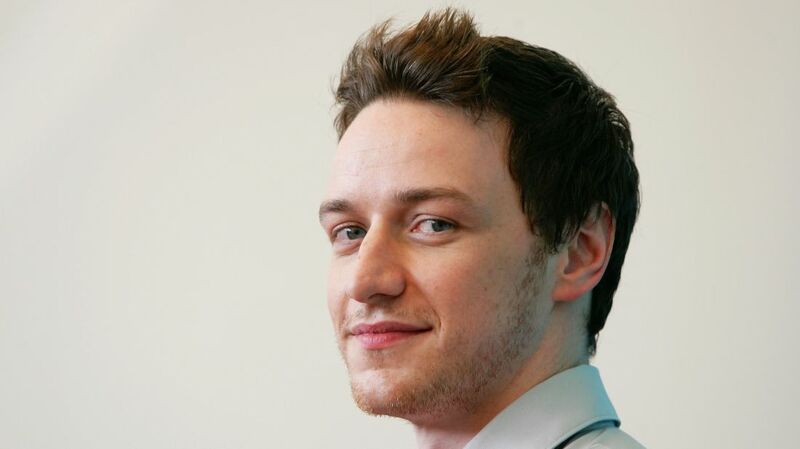 James McAvoy was born in Glasgow, Scotland, to a psychiatric nurse and a builder. However, his parents split when he was seven, and because his mother was in poor health, McAvoy and his sister went to live with their maternal grandparents. While his mother lived with them on and off throughout his childhood, McAvoy hasn’t spoken to his father since he was a kid. 2. He considered becoming a priest. McAvoy was brought up in the Roman Catholic church, but that wasn’t the reason he considered becoming a priest. Long before he decided to go the drama school route, he considered entering the priesthood because he thought it would give him an excuse to travel the world. "I wanted to be a missionary, but it was only because I wanted a free ticket to go and explore the world," McAvoy told The Telegraph in 2006. "I realized I was using God and religion to get my kicks so I knocked that on the head." 3. He married his on-screen love interest. While working on the UK version of Shameless in the early 2000s, McAvoy met his on-screen love interest and future wife, Anne-Marie Duff. The pair started a relationship that they kept very private, and married in 2006. They went on to also star in 2009’s The Last Station together, but McAvoy later announced he would no longer be working with his then-wife. "You have to weigh it up against how much of a headache it would be. It exposes you to a lot of questions," he told USA Today in 2011. "I'm very big in saying that I don't agree that if you put yourself in the spotlight, you have to accept it. I do think that if you work together as husband and wife, you're kind of asking for it." Ultimately, the couple split in 2016. 4. Acting was never his plan. 5. Band of Brothers was his big break. McAvoy’s big break came in HBO’s 2001 miniseries Band of Brothers, produced by Steven Spielberg and Tom Hanks. The actor played character James W. Miller in just one episode, but that’s all it took for his phone to start ringing; shortly thereafter, McAvoy scored notable roles on BBC’s Shameless (2004), The Chronicles of Narnia: The Lion, the Witch and the Wardrobe (2005), and The Last King of Scotland (2006). He wasn't the only up-and-comer who made a name for himself with Band of Brothers: Michael Fassbender, Tom Hardy, and Dominic Cooper were among his co-stars. 6. He’s a Golden Globe nominee. In 2007, McAvoy played Keira Knightley's love interest in Joe Wright’s period drama Atonement, based on the Ian McEwan novel. The role was one of the actor’s most moving performances to date, and scored him a Golden Globe nomination. Although he has wowed audiences in numerous parts since, such as the man with 23 different personalities in 2016’s Split (and 2019’s Glass), his role in Atonement has earned him the most critical acclaim. McAvoy, too, is a fan. "[T]o find a film that was so epic, sweeping and romantic, yet be intelligent, was nice to me," McAvoy said. "Also the fact that it’s a very classic story, but it’s told in a very contemporary and modern way." 7. He was slightly tipsy the first time he met M. Night Shyamalan. Inebriated or not, Shyamalan saw something he liked. One month later, he was on the set of Split (in a role that Joaquin Phoenix was originally set to play, but dropped out of at the last minute). 8. He admires Samuel L. Jackson's no-nonsense attitude. While promoting Glass, McAvoy participated in a lot of press events with Samuel L. Jackson, and was impressed by what he saw. "I saw examples of what I might be able to do when I got the balls he’s got,” McAvoy said. "That guy does not suffer fools, which is a positive quality. If he gets any kind of question that is in any way not thought out properly, he just drops the F-bomb and is like, ‘What are you talking about? What? What?’ He calls out [the journalist] so hard, and it’s the funniest thing." 9. He credits his success to a lot of luck. When asked about the secret to his success, McAvoy doesn't mince words: "I got lucky," he told The Talks. "I got so f***ing lucky that I fell into the lap of a director when I was 16 and he gave me a part in a film and my horizons immediately exploded wide with all the weird people in it and all these crazy f***ing actors and directors and artistic people who were from all over the world. Through that one job I met people from England, I met people from America, and I met people from all over the place with challenging points of view and sympathetic points of view to mine. And then I went to a youth theater for six months as well, and that expanded my mind massively. It gave me so much more confidence to find out who I was and not be afraid of who I was simply because I’m in a scenario that I don’t understand ... I got really lucky. I got really, really lucky. It’s been a good ride for me."